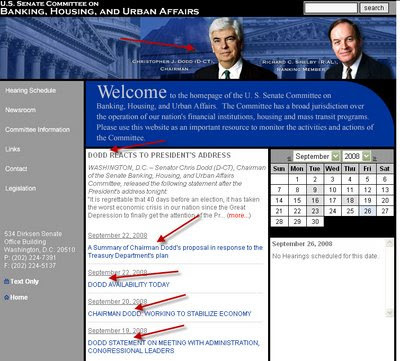 The September 5th blog entry, 'All about Smith Dodd', noted that the web site of the Senate Committee on Banking, Housing, and Urban Affairs appeared to be a paean to that illustrious legislator, that 'friend of the everyman', the one who selflessly sacrificed himself to bear the entire burden of effort while surrounded by 21 ciphers... Senator Christopher J. Dodd (D-CT). Alas, alack, woe is us! Today this colossus dashed our hopes and threw the country into the slough of despond by announcing that he will not run for re-election... After some thirty years of selfless and dedicated service this Titan will be departing the scene... Truly a day to mourn!